The Democratic National Committee has stayed silent so far on an ex-girlfriend's allegations of abuse against DNC vice chairman Rep. Keith Ellison (D., Minn.). Ellison's former girlfriend Karan Monahan has accused him of emotional and physical abuse during their relationship, and her son wrote on Facebook he saw a video of Ellison dragging her off the bed and cursing at her. Ellison, a progressive favorite running for Minnesota Attorney General, said there is no such video and denied any allegations of misconduct. The 44-year-old Monahan, who serves as an organizer with the progressive Sierra Club, told the New York Times Ellison's abuse was "insidious." She said she won't share the "embarrassing" video—she also says she misplaced the thumb drive that has it—but three friends corroborated her account of the bed incident to them after she moved out of Ellison's apartment, CNN reported. "It is the most difficult form of abuse to articulate," she wrote in an email. "It is a slow insidious form of abuse. You don’t realize it is happening until it’s too late." 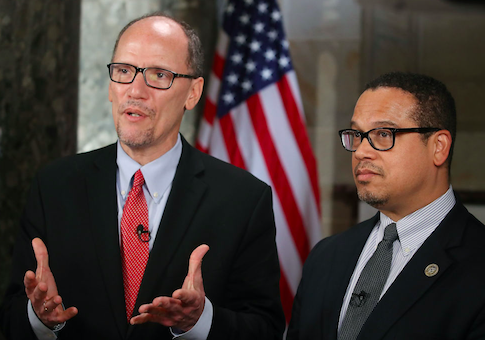 While the DNC has not commented so far on the allegation against Ellison, DNC chair Tom Perez tweeted positively about the resignations of Sen. Al Franken (D., Minn.) and Florida Democratic Party chair Stephen Bittel last year over various accusations of misconduct toward women. Another woman, Amy Alexander, accused Ellison in 2006 of emotional abuse during an affair they had and said he once grabbed and pushed her while arguing, Vox reports. Ellison said they never even had a relationship. Ellison is the first Muslim elected to Congress and is in the midst of his sixth term. He decided to forgo seeking a seventh term in his bid for Minnesota attorney general. He has already been dogged by controversy this year, dealing with his prior entanglements with the Nation of Islam and its avowedly bigoted leader Louis Farrakhan. UPDATE: Wednesday, 7:43 A.M.: The DNC told NPR on Tuesday it was reviewing the "disturbing" allegations against Ellison. This entry was posted in Politics and tagged DNC, Keith Ellison, Minnesota, Tom Perez. Bookmark the permalink.